It was a normal day. I was flipping through one of my magazines with my feet up and had just handed something to my husband that he needed to read over. Suddenly something over his way caught my eye . . . I couldn't believe it . . . were my eyes deceiving me? I closed my eyes and then opened them to look again. My husband was wearing old man glasses. Laughing, I asked, "where did you get those?" He told me that the ladies down at the drugstore helped him pick them out. My answer was, "I hope you didn't wear those to work." By his look I knew that indeed he had worn them to work. I groaned, "oh no, now everyone will think you are an old man." His answer was that he wanted to see and these helped. I just had to slip them on to make fun of him and that is when justice came down. Suddenly I could see clearer. (I didn't even know I couldn't see before I put those darn glasses on) Why did I have to go and make fun of him? Now I needed glasses too and I was just fine till then. . . So I went to town looking for some decent looking glasses. I remembered what Charla Krupp said in her book, How Not To Look Old. She said, "nothing ages you like. . . dated frames. . . boring frames . . . Frames that droop downward . . . metal frames . . . rimless glasses . . . half glasses . . . an eyeglass necklace . . . bifocals . . . coke bottle lenses. . . squinting." She goes on in her book to give you tips on exactly what eye wear would look best. I have dark hair so as per her instructions I picked glasses in brown, burgundy, and golden tortoiseshell. (Of course I used this as an excuse to get lots of pairs) I took my daughters and/or a friend along to help me make the right choices. Yes, I am wearing those old lady drugstore glasses, in fact I have a pair of them everywhere I possibly read (by my chair, by the computer, by the bed, in my purse, in the car, etc.) but I have cool looking ones that look really good on me so I don't mind slipping them on when I am out in public . If you are over 40 and the eyes are slipping as they are prone to do at that age then consider carefully what is in fashion at the moment and remember Charla Krupp's principles: "Principle 1: Defy gravity, If it's on your body, and headed south, it needs to make a U-turn. Your eyeglass frames are no exception." (Make sure your frames are horizontal with a slight upward tilt on the outer edges and avoid any downward slope on the sides) "Principle 2: Bring warmth, color and softness to your face." If any of you out there in bloggerland have been secretly wearing glasses at home, I give you permission to come out into the open with the rest of us "over 40's" Just make sure you are wearing hip frames that flatter you and have fun with them. I put all the entries in the pot (so to speak) and I drew out a winner. The winner of last week's giveaway is Leigh of Bloggeritaville. You really should go over and congratulate her and check her really cool blog out. It is a bright sunny place to stop in and they are very friendly over there. Congratulations to Leigh! Thanks to everyone who entered my giveaway. Note: This was not a paid post and there was no exchange of goods or services for the recommendations in this post. 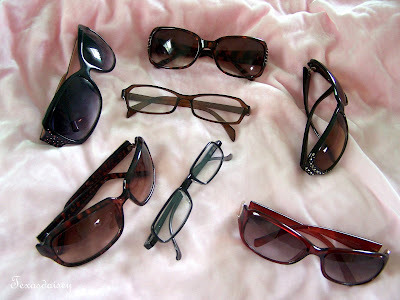 It is time to show up your glasses collection!